Mr. Wilson is a management consultant and researcher based in Victoria. He specializes in issues of collaborative governance, regional stewardship and collective intelligence. Unitl his retirement in 2017, he was a Senior Research Fellow with the Governance Project at the University of Ottawa, where from 1997 he was a researcher, consultant and lecturer. Between 2003-2006 he was also the managing partner of Invenire, an Ottawa-based think tank that explored issues in governance, stewardship and collaboration. His interests have focused on the issues of collective action and distributed governance such as may be found in the governance of collaborations; public-private-partnerships (P3s), and the management of various multi-stakeholder initiatives such as smart communities and community networks. He has been involved in the development of community information systems and indicators; as well as the governance of local workforce systems for the City of Ottawa. Christopher was also a key researcher in a series of comparative studies of community collaboration; the governance impacts of e-commerce and e-government; and the learning dynamics of regional innovation. 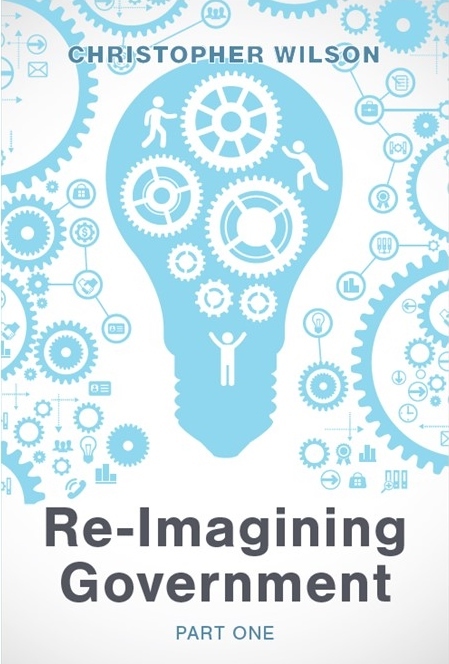 Mr. Wilson has recently published a new book entitled, Reimagining Government - Part 1 , a two-book series that was published in June of 2018. His previous book Intelligent Governance , was co-authored with Canada's leading governance researcher, Gilles Paquet, and it explored how to strike the ‘right governance fit’ in complex environments where knowledge, resources, and power are widely distributed, where processes must be collaborative, and where different groups have something to contribute towards joint outcomes, even as they may only partake in joint operations voluntarily in the pursuit of their own objectives. As a consultant, Mr. Wilson’s work has focused on the management and evaluation of collaboration and partnerships. He is currently working as a developmental evaluator with Canada's National Ballet School in Toronto to help them scale up their Sharing Dance program across the country. This work has followed on asssignments with PHE Canada's Health Promoting Schools initiative and the Canadian Active After School Partnership . He has also worked on collaborative projects with all three levels of government, local Ottawa hi-tech companies, like Nortel and Mitel, and various community organizations. Christopher holds an MBA from the University of Ottawa and was a part-time lecturer at the Telfer School of Management at the University of Ottawa for almost two decades until his retirement in 2016. He taught 1000's of students in courses on governance, collaboration, partnership and e-governance at both graduate and undergraduate levels. While at the University of Ottawa, Christopher led a team of researchers to assess the state of Ottawa's workforce, producing a series of three reports, collectively entitled Ottawa Works, which examined both the context and profile of Ottawa's talent pool and that proposed a set of comprehensive recommendations to align Ottawa's workforce with the realities of a 21st century knowledge economy. These reports became the basis of conversations among the key labour market stakeholders in Ottawa and ultimately the City's labour market strategy. Until his retirement in 2017, Christopher was Vice President of theSocial Planning Council of Ottawa where he worked with the community on issues of community economic development, inclusion, access to basics, and voluntary sector supports. He is a member of the Institute of Public Administration of Canada and, until recently, was a board member of IPAC's NCR Regional Group until 2017. He was a founding member of Transition Ottawa and was a co-Chair of SmartSites , a community organization established to help coordinate public Internet access in Ottawa . Throughout his career, the basis of Christopher's work has been the recognition of the fundamental need for individuals and organizations to find more effective ways to learn and work together. Despite the many overlapping and competing forces reshaping today's society, the pressure to achieve more effective systems of cooperation continue to be paramount. To better understand the confluence of these changes requires new frameworks and new paradigms, new skills and organizational practices, improved levels of trust and transparency, and more creative mechanisms for satisfying contingent cooperation so that citizens, business people, and governments can make better use of their respective resources to provide more effective solutions to their shared challenges.